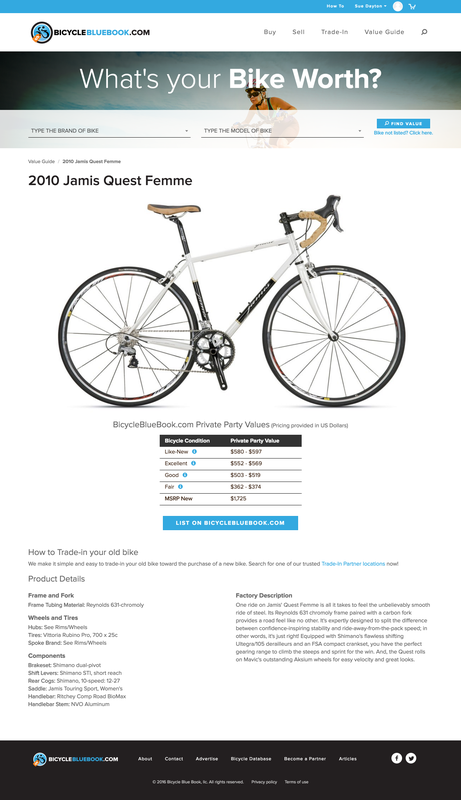 Building an ecommerce site for the biggest used bike retailer. BicycleBlueBook became the trusted source for determining a used bicycle’s value. 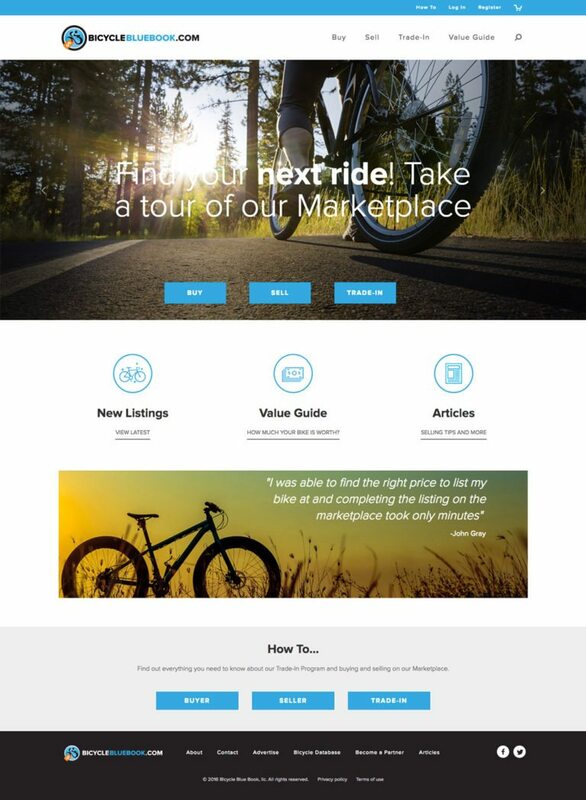 It was time for their web presence to help them break into the $2 billion used bicycle market. BicycleBlueBook built a free tool to evaluate the price of used bicycles, and that tool had gained massive traction. They quickly became the go-to source for used bicycle specs and data. But as of 2016, BicycleBlueBook hadn’t built the infrastructure to facilitate the resale of used bikes. 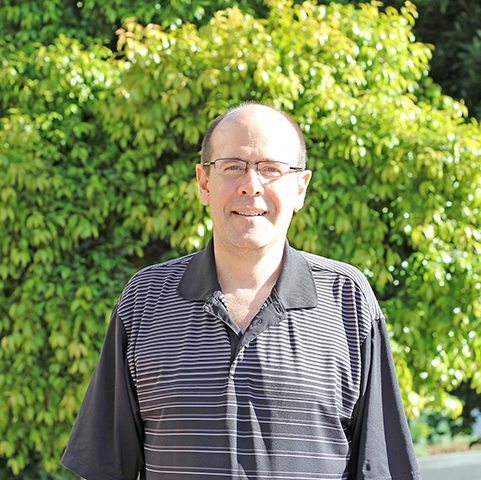 With a rapidly expanding network of dealer partnerships, it was time for BicycleBlueBook to significantly expand its online presence and functionality, supporting its dealers and its own growth. BicycleBlueBook was purchasing bikes from their trade-in partners — local bike shops — then reconditioning them and selling the bikes online. Using their own time to resell on someone else’s platform, and paying the fees for those platforms, was eating up BicycleBlueBook’s margins. While BicycleBlueBook would still purchase and resell used bikes from their trade-in partners, people would also to be able to sell bikes peer-to-peer. In exchange for providing users with a streamlined, purpose-built peer-to-peer environment, BicycleBlueBook would charge a small commission. BicycleBlueBook planned to offer multiple value-adds for their users, like subsidized cheaper shipping. But in order to be a truly fantastic value, their marketplace would need to significantly improve the listing experience. Our solution needed to be easier, otherwise people would resort to old but familiar standbys, such as eBay and Craigslist. BicycleBlueBook needed a solution that supported a broad ecosystem of users and use cases. The “I’ll Handle It” Seller. The “You Do It” Seller. The “We’ll Sell It” Bike Shop. The “BicycleBlueBook Can Sell It” Bike Shop. There are multiple turnkey e-commerce solutions, and some of them are pretty good. A simple subscription with one of them will allow any business to get started selling to customers. But where are are the turnkey solutions that will allow you to easily setup a multi-tenant ecommerce site? A market where people can sell to one another? There are a small number of options, and none of them were going to deliver the level of use-case specificity and listing ease we needed. 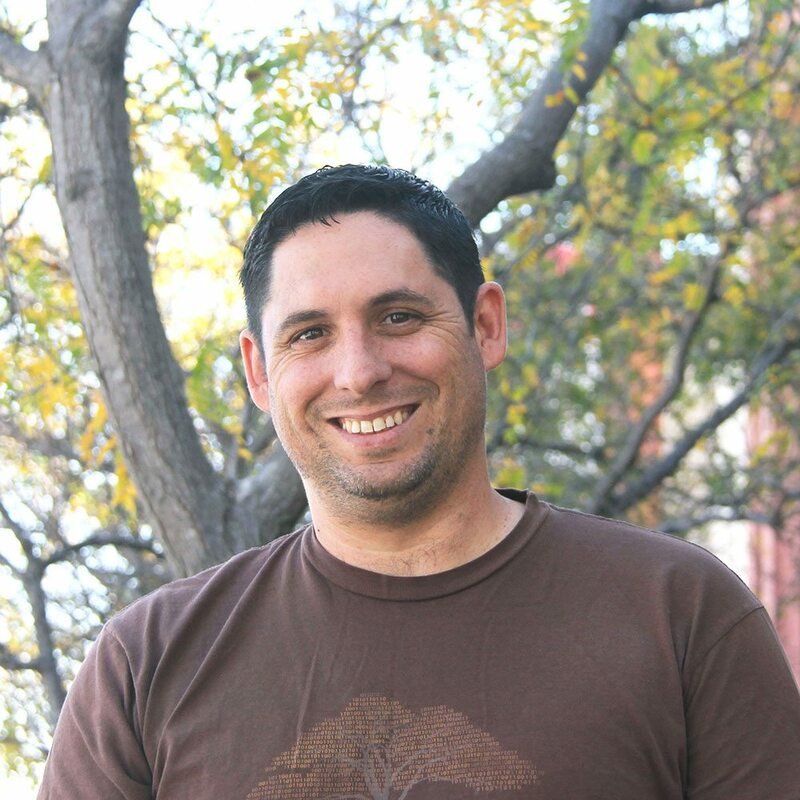 So Launch Brigade would build the peer-to-peer marketplace from the ground up. After putting together our notes and holding collaborative meetings with the BicycleBlueBook team, we outlined a creative brief and identified the color palette, logo, and type families to be used. At the same time, we went to work on a set of low-resolution wireframes, demonstrating how the final page layouts might look. Going through an iterative process, ensuring that all the stakeholders were happy, different features started to materialize and an intuitive workflow emerged. It was time for high-resolution comps created in Photoshop and Sketch. As we explored more screens in higher definition, the vision for the website as a whole came together. With an intuitive peer-to-peer experience mapped out for all of our sellers and buyers, we turned our high-resolution comps into a set of interactive prototypes using InVision to further refine the UI design. At this point, we had fully designed templates ready to handover to our partner stakeholders and guide our own developers. So we turned our attention outside of the website itself, to the other points of user interaction that required careful design thinking, such as the structure of emails and notifications bouncing between buyers and sellers in our peer-to-peer marketplace. Interbike International Expo, the cycling industry’s biggest trade show, was approaching fast, and BicycleBlueBook was gearing up to make an impression. So we split the project across different internal micro-teams for development and got to work. Launch Brigade would build the entirely new marketplace portion of the site, handing off our designs to a partner who would re-skin the existing parts of the site, with both teams collaborating on quality assurance across the board. For the marketplace, our back-end developers started with preliminary architecture, putting together the database, determining its structure and building out our data models. Then we configured a software framework around this initial data. Our back-end developers also examined the logic layer for the shopping experience. Sorting and displaying bikes in the way the a customer specified, skimming and navigating through a grid of bicycle thumbnails, mousing over those thumbnails to get quick information, and clicking through for more detailed information all had to be accounted for and modeled. Additional aspects included shopping cart functionality and purchasing functionality, including management of shipping costs and options. There also integrations with PayPal, our payment processor. 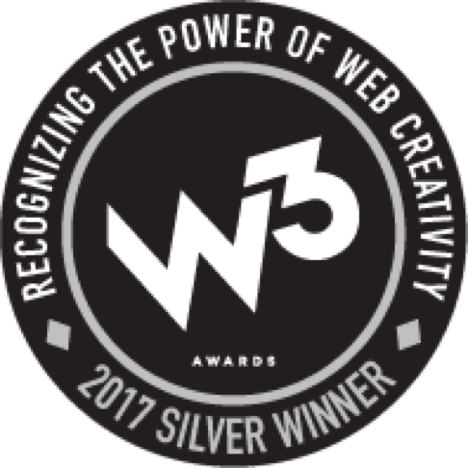 At the same time, our front end team worked in HTML5, CSS, Angular, and the Twig templating language to turn our comps and prototypes into fully functional pages. BicycleBlueBook remains the leader in its space, and better positioned than ever to move forward at the head of the pack. BicycleBlueBook’s site fields over half a million hits per month. Users can create a listing, search through well organized listings, buy bikes, and use a single sign-on system across the entire site (even though the main site and the marketplace were built on two different platforms). Users who want to sell their bike peer-to-peer through BicycleBlueBook are able to purchase shipping for less than if they went straight to FedEx or UPS. 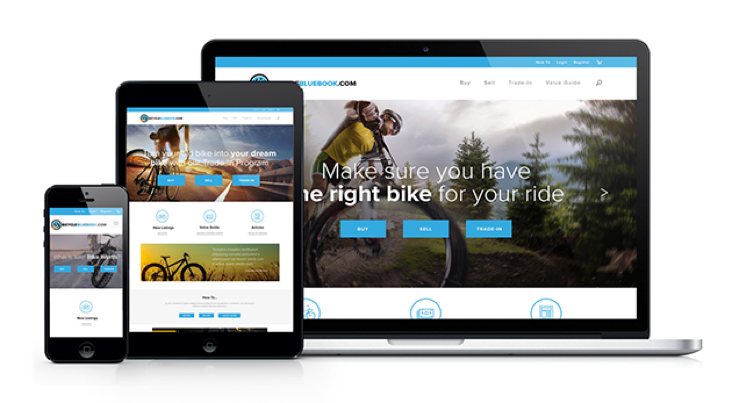 The new site supports more than 750 trade-in partners nation wide, and it also increased PR attention, allowing BicycleBlueBook to attract even more bicycle shops into their network.